An extraordinary artist, Lily Afshar has grounded her career on a strong foundation of excellent formal education, upon which she has built an exceptional record of innovative achievements. With a bachelor’s degree from The Boston Conservatory, she earned her Master of Music at The New England Conservatory and went on to study at Florida State University, where she became the first woman in the world to be awarded the degree of Doctor of Music in guitar performance. She pursued greater proficiency with summer studies at the Banff Centre for Fine Arts and the Aspen Music Festival, advanced training at Gargnano, Italy, the Accademia Musicale Chigiana in Siena, and master classes with Andres Segovia at the University of Southern California. Since becoming a tenured professor and head of the guitar program at the University of Memphis Rudi E. Scheidt School of Music, Afshar has received the 2000 Eminent Faculty Award, and in 2011 she was honored with the Distinguished Alumni Award from The Boston Conservatory. She conducts master classes worldwide and has released six instructional DVD’s “Classical Guitar Secrets”, Vols. I & II for beginner to Intermediate guitarists, and six instructional DVD’s “Classical Guitar Collection”, Vols. I & II for Intermediate to Advanced guitarists. Both are released with Guitarcontrol.com. She also produced a DVD entitled “Virtuoso Guitar” featuring live performances and an interview with Mel Bay. 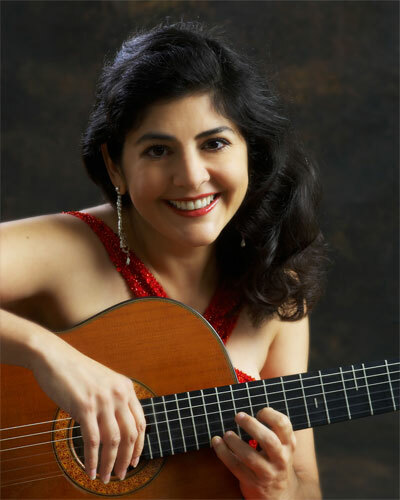 As a performing guitarist, she has won a top prize in the Guitar Foundation of America Competition, Grand Prize in the Aspen Music Festival Guitar Competition, the Orville H. Gibson Award for Best Female Classical Guitarist, and a National Endowment for the Arts Recording Award, among others, and she was chosen as an “Artistic Ambassador” to Africa for the United States Information Agency.